Trivandrum, 25 April 2017: Kovalam beach will soon feature a musical fountain. 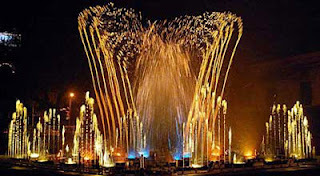 The installation of a new musical fountain is planned at Kovalam Light House and will be the biggest in the state. Currently the musical fountain at Kannur is the highest at 22 metre whereas the Kovalam fountain will be at 35 metre. The light house area will also feature a cafeteria, garden too. Visitors to the Light House has been on the rise after the launch of a new lift service at the venue.